1 - 4) One or Two?? Select whether the picture is from a scene in Kill Bill: Volume 1, Kill Bill: Volume 2, or neither. 7) Who directed the Kill Bill movies? 8) What island of Japan did The Bride first fly to, in Volume 1? 14) In the second flick, what kind of snake did Elle put in the briefcase to kill Budd? 9) What kind of sword did she have made in the first flick? 15) What was the name of the deadly one-strike killing technique that Pai Mei taught The Bride? 10) In the box of what brand of cereal did Vernita Green keep her handgun, in Volume 1? 16) Who did we learn had removed Elle Driver's eye to make her a one-eyed woman, in Volume 2? 11) What was the name of the assassin group that the Bride was a member of, before all the kerfuffle? 17) What was the name of the movie that Uma's daughter wanted to watch before going to sleep? 12) Who was originally supposed to play the role of "Bill" in the movies? 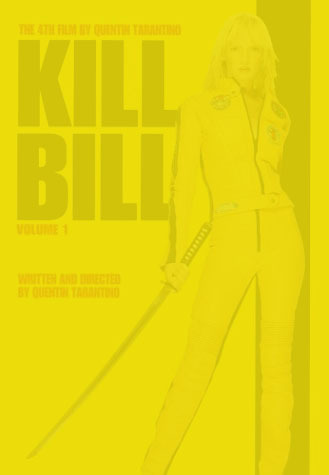 18) When all was said and done, at the end of the second movie, Uma Thurman did indeed Kill Bill.